Mr Sokchea An has recently published a paper in the Australasian Agribusiness Review with Dr Richard Culas from Charles Sturt University. With Crawford Fund support Mr An, a Cambodian World Vision program officer, who was a Crawford Fund trainee back in 2014, completed a nine-week training course in 2014 on Agribusiness Planning at Charles Sturt University. 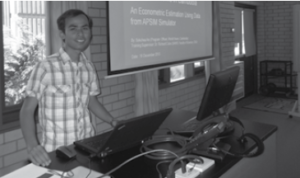 His training focussed on learning how to use the Agricultural Production System Simulator (APSIM) for rice production in Cambodia to support his research on improving rice productivity and farmers’ income in Cambodia. APSIM was used to simulate possible rice production scenarios and estimate farmers’ incomes from each scenario. The objective of his research is to help farmers to optimise their returns by choosing a scenario with optimal productivity and gross margin. The paper, Impact of Contract Farming with Farmer Organizations on Farmers’ Income: A Case Study of Reasmey Stung Sen Agricultural Development Cooperative in Cambodia, is the result of ongoing collaboration with Dr Richard Culas who is a lecturer in Agricultural Economics/Agribusiness at the university. A range of out State training programs support training to assist developing country researchers to have their work accepted in English language journals to help raise awareness of important research and to boost their academic careers.